There are many different forms of soil pipes and fittings, and one can best acquaint himself with these by looking over the catalogues of different manufacturers. Fig.. 47 and 48 show two lengths of soil pipe; the first is the regular pattern, having only one hub, and the second is a length of double-hub pipe; this can be used to good advantage where many short pieces are required. Fig.. 49 to 57 show some of the principal soil pipe fittings. Fig.. 49, 50, 51, 52 and 53 show quarter, sixth, eighth, sixteenth and return bends respectively, and by the use of these almost any desired angle can be obtained. Different lines of pipe may be connected by means of the Y and T-Y branches shown in Fig.. 54, 55, 56 and 57. 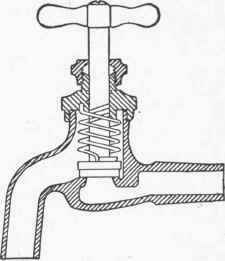 The T-Y fitting, Fig. 56, is used in place of the Y branch, Fig. 54, in cases where it is desired to connect two pipes winch run perpendicular to each other. The double T-Y, Fig. 57, is convenient for use in double houses where a single soil pipe answers for two lines of closets. Pipe Joints. Great care should be given to making up the joints in a proper manner, as serious results may follow any defective workmanship which allows sewer gas to escape into the building. In making up a joint, first place the ends of the pipes in position and fasten them rigidly, then pack the joint with the best picked oakum. In packing the oakum around the hub, the first layer must be twisted into a small rope so that it will drive in with ease and still not pass through to the inside of the pipe where the ends join. In a 4-inch pipe the packing should be about 1 inch in thickness and calked perfectly tight so that it will hold water of itself without the lead. Just before the packing is driven tightly into the hub, the joint should be examined to see that the space around the hub is the same, so that the lead will flow evenly and be of the same thickness at all points, as the expansion and contraction will work an imperfect joint loose much sooner than one in which the lead is of an even thickness all the way around. Only the best of clean soft lead should be used for this purpose. In calking in the lead after it has been poured, great care must be exercised, as the pipe, if of standard grade, is easily cracked and will stand but little shock from the calking chisel and hammer. Fig. 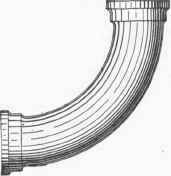 58 shows a section through the calked joint of a cast iron soil pipe. 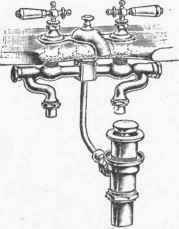 This is used but little in connection with the waste pipes except for the purpose of back venting where it may be employed with screwed joints the same as in steam work. It is sometimes used where only small drain pipes are necessary, but is not desirable as it is likely to become choked with rust or to be eaten through by moisture from the outside. 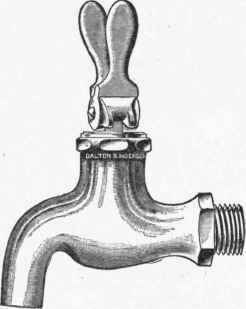 Brass pipe, nickle plated, is largely used for connecting open fixtures, such as lavatories or bath tubs, with the soil pipe. It is common to use this for the exposed portions of the connections and to use lead for that part beneath the floor or in partitions. The various fittings are also made of brass and finished in a similar manner. For sinks, bath tubs, laundry tubs, etc., nothing is better for carrying off the waste water than lead pipe, for the reason that it has a smooth interior surface which offers a small resistance to the flow of water, and does not easily collect dirt or sediment. It can also be bent in easy curves which is an advantage over fittings which make abrupt turns; this is especially important in pipes of small size.